Dissolve one portion of the product (22g – 1 2/3 scoop) in 500 ml of water. Drink once a day during training. Do not exceed the recommended daily dose. For people who train hard I recommend doubling the dose. It is also reasonable to divide the supplementation – one portion 30 minutes before training in order to feel the full stimulating potential of the supplement from the first minutes of the training and the second portion during training. It is also worth mentioning the worries regarding vitamin C. In fact, its supplementation around training is inadvisable in the period of building muscle mass, however, studies show that the portion above 1 g may negatively influence the development of muscle tissue and in one portion of the supplement there is only 200 mg of vitamin C, therefore we do not need to worry about taking it during training. DL-malic acid (hydroxysuccinic) - derived mostly from fruit, as well as food additive for the adjustment of its acidity. It takes part in the so-called. Krebs cycle (formed with fumaric acid, oxidized to oxaloacetate form). It is a component of creatine malate and citrulline, creating a single molecule, increasing their action. This results in greater availability of creatine and citrulline. It improves the absorption of magnesium. It is part of ergogenic supplements. Amino matrix is an amino-acid complex containing egzogenic amino acids (leucine, isoleucine, valine) and glutamine peptides, which are functional and building components of protein origin (BCAA). Maintains nitrogen balance of the body. It contributes to the reconstruction of the cells after exercise, supports regeneration and contributes to the improvement of exercise capacity (strength and endurance). It has a positive effect on the immune system, reducing the risk of infection. 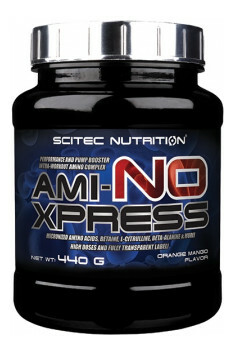 Amino matrix is an complement to the CytoSport Monster Milk preparation formula.